When Marwan Hage and his family moved to Montreal from Beirut, Lebanon, in 1990, he was just nine-years-old. He had no expectations of playing professional football and never even played football at that point. Coming from a family of athletes, Hage started playing football and found a love for it. At the age of 23, Hage was drafted out of the University of Colorado in the second round of the CFL Draft by the Hamilton Tiger-Cats and has continued to call Hamilton his home for the past 9 years. Playing on the offensive line, the six-foot-two centre has been active in almost every game since being drafted in 2004. Aside from making a presence on the field every year, Marwan has been making a difference in the Hamilton community since 2006 when he started Hage’s Heroes; a program dedicated to leaving a lasting impression in the community of Hamilton. “The entire program is set up for kids and for them to enjoy each other and have fun and it’s a positive experience all around,” stated Hage. Through Hage’s Heroes Marwan helps youth experience the game of football, gives back to the less fortunate people living in Hamilton and helps the children at McMaster Children’s Hospital. He brings out groups of underprivileged kids to each home game where they are provided with lunch and a Hage’s Heroes T-shirt; they get to sit in exclusive seats and even get to meet some of the players on the Ti-Cats. Some of the other things he is involved in throughout the city of Hamilton are Thanksgiving food drives, Christmas toy and food drives, and he also makes an annual donation to the McMaster Children’s Hospital. Since coming to Hamilton in 2004, Hage has worked closely with CFL legend Angelo Mosca on Hage’s Heroes. 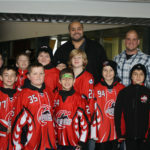 Mosca has been a role model for Hage since coming to Hamilton and has shown him the all the ropes of being a professional athlete living in Hamilton. Like Mosca, Hage’s name is well known in the city and is someone who is highly respected by the Ti-Cats fans. “Angelo is great, he wears his emotions on his sleeve as well so I always enjoy my conversations with him and every time we talk the conversations go on for like two hours because we both enjoy talking,” chuckled the four-time CFLPA All-Star. When Hage started Hage’s Heroes he didn’t expect it to get to where it is today. He started it out of the goodness of his heart hoping to change some lives around the city and it has continued to grow each year, helping thousands of people along the way. Despite being a professional athlete, Marwan always tells the youth to follow their dreams and do what they want to do. Whether it be a professional athlete, chef, doctor, etc., Hage just wants to influence today’s youth to follow their dreams and do what makes them happy. “I never tell kids to be a professional football player, I tell them to be what they want to be,” explained Hage. “I want them to have a dream and go after it, no matter what it is. We have to understand that not everyone is going to be a professional athlete and that there is more to life than sports. You have to do what makes you happy,” he concluded.